Squats are a great functional exercise which make everyday activities easier such as sitting down or standing up and even bending to lift things. Try using this technique everytime you lift something up off the floor and this should help with posture and prevent back injuries from lifting. Squats can also increase your sports performance by engaging your glutes (bum muscles) to help you run easier or faster or even further and (most importantly) helps get a nice toned bum. Starting with your feet shoulder width apart, or just slightly wider if you need extra balance, stand with your feet facing forward. Imagine you are going to sit down onto a chair behind you, pushing your hips back keeping your chest up, lower yourself down into the squat position. From here simply stand back up tall and repeat. 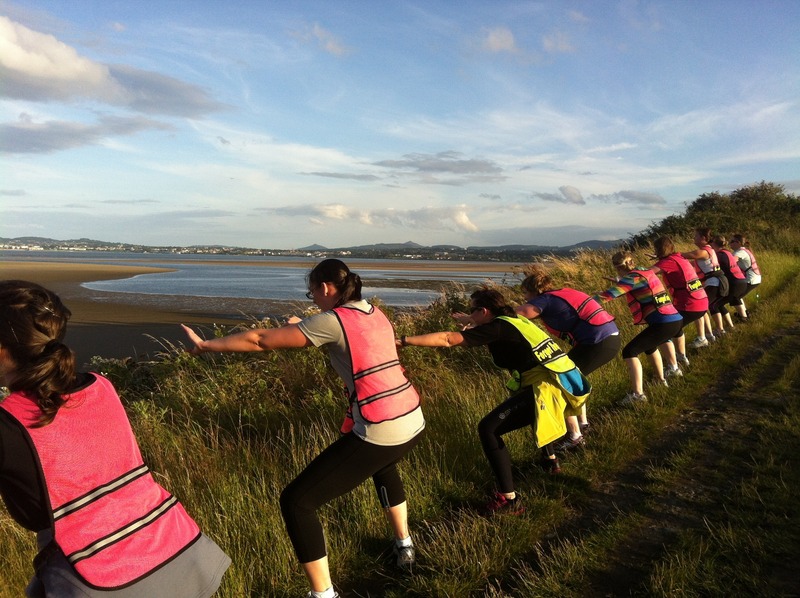 Remembering to keep your chest and head forward facing to protect your lower back. Breathe in as you sit down into the squat and breathe out as you push through your heels up to standing. Keep your knees in line with the direction your feet. Imagine your knees going along a line just between your middle and big toe. 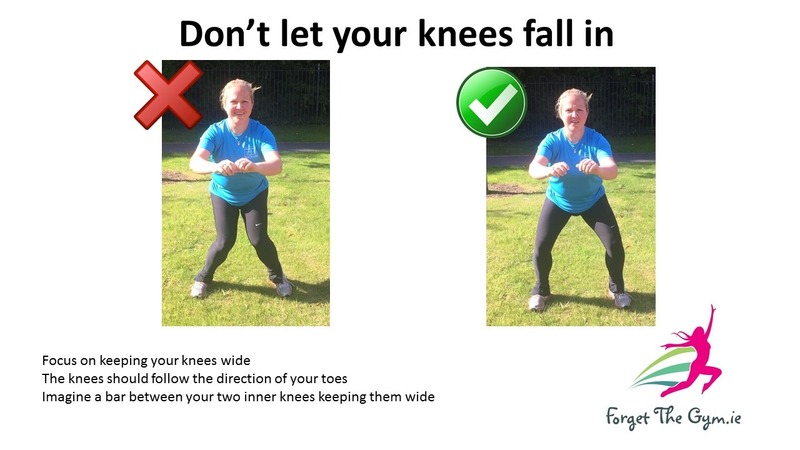 Don’t allow your knees to dip in or fall outwards. When you are down in the squat ensure your knees do not extend over your toes. You can make this easier by focusing on sitting back keeping your chest forward. Work within your own range of movement and decide what level is comfortable for you to drop down to. * Hands can be used for balance out in front or on your hips whatever is comfortable for you. * Inhale as you lower down into the squat and exhale as you push through your heels up to standing. 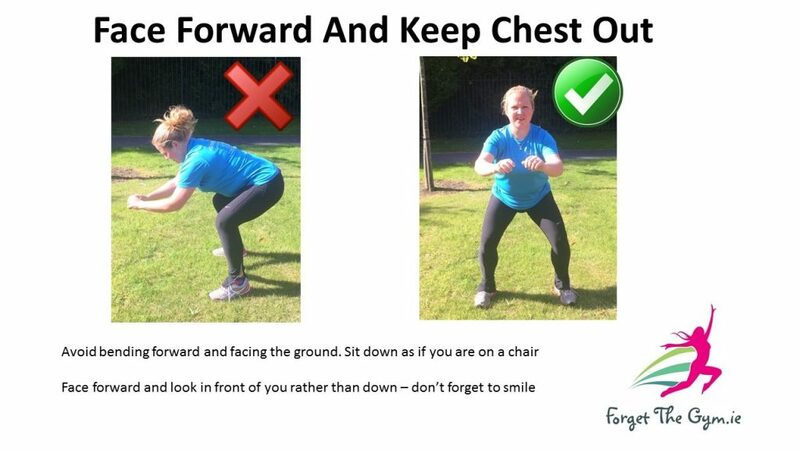 * Remembering to keep your chest forward facing to protect your lower back.